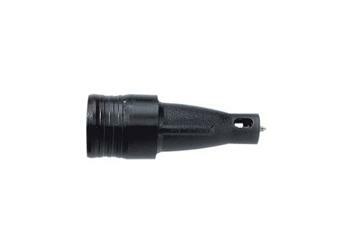 Low cost, lightweight depth locator for Milwaukee 6742-20 and 6740-20 Drywall Screwdrivers. Insert molded extra hard stainless steel tip provides stronger protection from the scarring of drywall screws on the working end of the locator. Acetal resin formulated for maximum toughness. The patented ramp-off locator has depth adjustment designed for the professional. The positive indexing nose is indexed in 1/64 inch increments per two clicks of the index tabs. Rotate the nose to the right to set the fastener deeper. Rotate the nose to the left for a more shallow setting.